During your angioplasty procedure, your doctor may decide a stent will further improve your heart health. 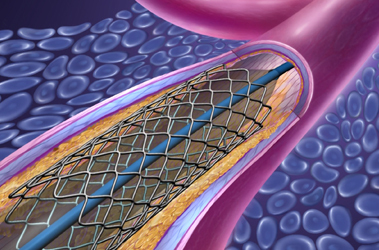 A stent is a small metal device that is placed into your artery to increase blood flow. Using a catheter, the stent will be advanced to the spot where the plaque was compressed, and inflated to expand the stent against the artery wall. The stent will stay in place providing structural support and reducing the risk that this part of the artery will narrow again. There are two types of stents - bare metal stents and drug-eluting stents. Over a period of months, new tissue will grow over the bare metal stent covering it completely. A drug-eluting stent is a metal stent that has been coated with a drug. This drug is released slowly and decreases the speed that new tissue grows. Stents are not used in every procedure. Your doctor will decide if a stent is right for you based on artery size, the amount and location of the blockage, and other considerations. If a stent is used, you will be given a special medication, called an antiplatelet agent, to prevent blood clots from forming. Depending on the type of stent used, the amount of time you need to use this medication will vary. The angioplasty and stenting procedures usually take about one hour. If you have a drug-eluting stent, you will take aspirin every day. You'll receive an I.D. card identifying the type of stent that was used. Keep this card with you at all times. Not all angioplasties require stenting. If you need an angioplasty, your doctor will decide if a stent is right for you, based on the location and size of the blockage. If you do have a stent, talk to your healthcare provider about any guidelines you can follow to ensure a healthy recovery.